The symbols on the side of the helmet are for a Guards Division and for a Red Banner Medal that was presented to the Guards Division. 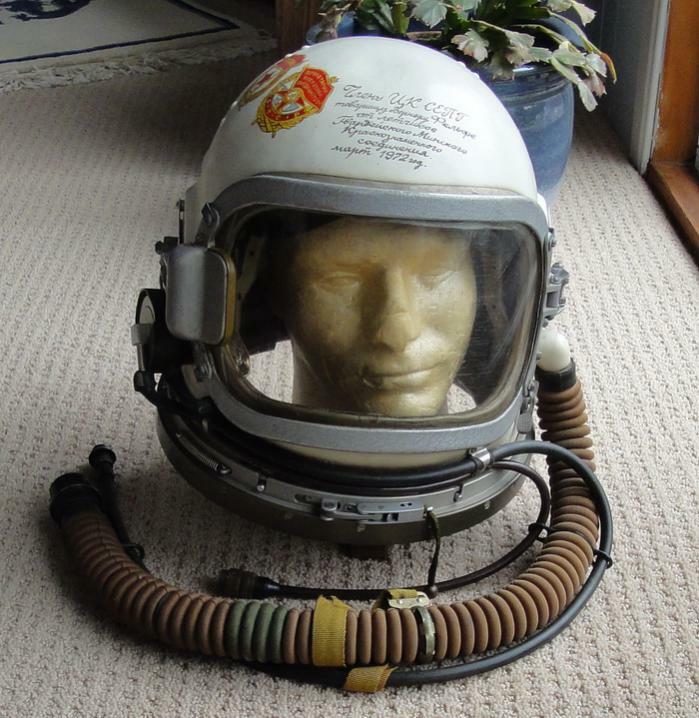 The inscription is engraved into the helmet. 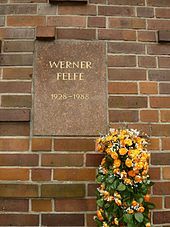 Werner Felfe (born January 4, 1928 in Großröhrsdorf , † September 7, 1988 in East Berlin ) was a member of the Politburo of the Central Committee of the SED in the GDR . Felfe completed a commercial education. He joined the KPD in 1945 and became a member of the SED with the compulsory unification of the SPD and KPD in 1946 . In 1946 he joined the FDJ . Until 1953 he worked for the SED district administrations Kamenz and Flöha and the regional government of Saxony . He attended the Party School in 1953 and was until 1957 second secretary of the Central Council of the FDJ. 1954 to 1958 he was chairman of the Youth Committee of the People's Chamber , 1954-1963 candidate and then a member of the Central Committee (CC) of the SED . 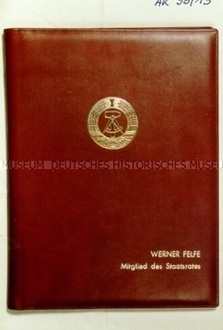 From 1957 to 1960, Felfe worked as Deputy Chairman and Chairman of the Council of Zschopau County and until 1963 as Chairman of the Council of the district Karl-Marx-Stadt . He graduated 1963-1965 after studying at the industrial institute of the technical university Dresden . He was then deputy head of department and from 1966 secretary for agitation and propaganda at the Central Committee of the SED. In 1968, Felfe became second secretary, in 1971 as successor to Horst Sindermann first secretary of the SED District Administration Halle . Since 1973 he was a candidate and since 1976 a member of the Politburo of the Central Committee of the SED and the National Defense Council . As secretary of the SED Central Committee for Agriculture, in 1981 he initiated a course correction in agriculture aimed at lifting the separation of animal and plant production, reducing bureaucracy and saving resources. On August 8, 1988 there appeared in the West German news magazine Der Spiegel an article in which there was speculation about a possible successors to Erich Honecker . The time of the change was assumed to be autumn 1989, when it was assumed that the 40th anniversary of the founding of the GDR was an appropriate date. As a possible candidate for the succession to Honecker, those was mentioned in the article, in addition to Egon Krenz, were Siegfried Lorenz, Günter Schabowski and Werner Felfe. Felfe was quoted in the article (analogously): "The political perestroika may not stop before the GDR." Just over a month after the article was published, Werner Felfe died of acute heart failure at the age of 60. His urn was buried in the memorial of the socialists in the central cemetery Friedrichsfelde in Berlin-Lichtenberg . Awards: VVO - 1974; KMO - 1978; form “WER WAR WER IN DER DDR” Edition printed in 2006. Pictures of some articles bearing Felfe's name that I found on the net. The picture of red folder, used by members of the Central Committee of the SED, is from the HGM.